This is a readable and enjoyable account of the journey of the intriguing Gerald of Wales in 1188, when he travelled around Wales with the then Archbishop of Canterbury trying to persuade Welshmen to sign up for the Third Crusade. Michael Curig Roberts is a former Chartered Accountant,and is descended from the landlord of the former Royal Inn at Capel Curig. He now lives in England and France, but relishes returning to the Land of his Fathers. Gerald was a lively and witty man, with a penchant for telling elaborate stories. He portrays the Welsh as strong fighters who defend their homes and land with their whole hearts, but who can also sing in cynghanedd and are able with words. 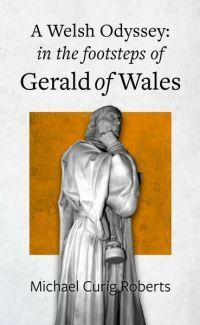 Gerald’s writings bring to life the latter days of the Age of Princes, and this book will appeal to anyone interested in the history and politics of the Wales of his age, but will also provide insights into the Welsh mind of the Middle Ages. Includes a preface by Eurwyn Wiliam, Curator Emeritus of the National History Museum, St Fagan’s, Cardiff.